Was 2016 the Deadliest Year for Celebrities? 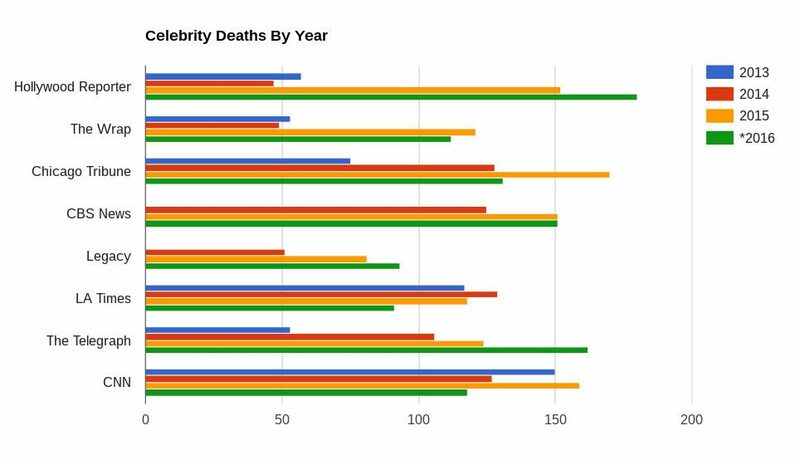 While many high-profile celebrities passed away in 2016, the overall "notable death" count for the year was not unusually high. Of course, attempting to quantify such a feeling involves several basic issues. Primarily, what makes a person a celebrity? Whose deaths are considered notable? For instance, the Los Angeles Times listed 91 “leaders, stars and other notable figures who died in 2016,” while CBS News charted more than 150. So what standard(s) do we use? *The number of deaths listed for 2016 was compiled before the end of the year, on 27 December 2016. While a large number of celebrities certainly passed away in 2016, the number wasn’t unusually high when compared to those of recent years. The Hollywood Reporter, Legacy.com, and The Telegraph all counted more celebrity deaths in 2016 than in the previous three years, but this year ranked second, third, or even fourth among that group according to other news outlets. There may not, in fact, have been an unusual number of celebrity deaths this year, but they seem to have been much more salient than before. Part of this must be the result of the growing reach and responsiveness of digital media. Technology makes it possible to observe and react to a distant readership almost as accurately and immediately as an actor can respond to their audience in a theatre. Sudden emotional impulses are amplified with astonishing speed across the internet just as they can be in a crowd. Each apparently solitary smartphone user is really sharing other people’s emotion as well as their own. It’s not just emotions that are shared in this way. It’s memories as well. The generations of middle-aged people along with all their children and grandchildren have experienced a kind of collectivisation of childhood. This was a historic shift. Before the mass media, childhood memories were shared among very small groups, and anchored to particular places. But for the last 60 years, children in the west, and increasingly elsewhere, have grown up in front of televisions, and many of the most vivid characters of their childhood and adolescence were actors or singers. 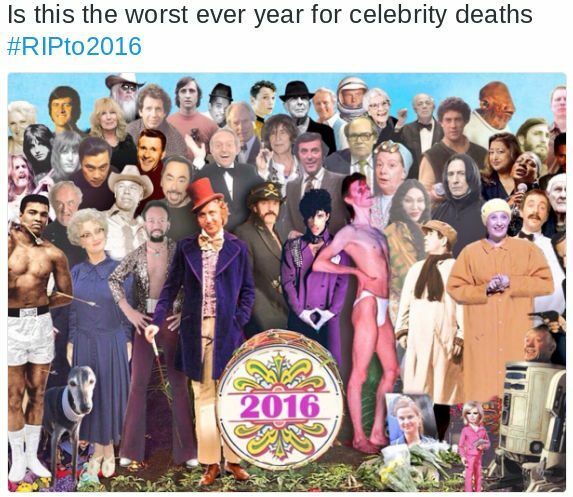 The celebrities that have died so far this year are unusually prominent, beloved figures. The 2016 deaths of David Bowie, Alan Rickman and Prince are more notable for most than, say, the 2015 deaths of Stan Freberg, Geoffrey Lewis and Johnny Kemp — as significant as they may have been. Some, like Prince or A Tribe Called Quest’s Phife Dawg, have also met unexpectedly early ends. The number of media sources reporting such information may have also contributed to the perceived “rise” in celebrity deaths. Whereas previous generations encountered celebrities primarily via three network TV channels and a handful of print publications, today’s generation consumes entertainment through a multiplicity of sources. This change in the entertainment landscape has led not only to an increase in reports about celebrity deaths, but also to an increase in the overall number of persons considered to be celebrities. Reality shows such as Dancing with the Stars also bring older, “forgotten” celebrities back into the public eye, making their eventually passings even more impactful among those who might otherwise overlook them. It should also be noted that the above-displayed data don’t actually encompass the “true” numbers of notable deaths, as there is no standard way of determining which deaths are notable and which ones aren’t. It would be more accurate to say that these data tally the number of deaths the mainstream news media deemed worthy enough to mention. And since online celebrity death reports typically generate large numbers of clicks and page views (which explains the prevalence of Internet death hoaxes), one explanation for the seeming uptick in celebrity deaths might be that online publications are simply publicizing more of them in order to attract viewers.